I learn that the 40.2m motor yacht Monte Carlo has joined the sales fleet at Yachtzoo in Fort Lauderdale as a co-central between Rob Newton and Sean Doyle. Monte Carlo was delivered by Amels in 1988 and accommodates up to 10 guests in a master, VIP, double and twin and also has a sofa bed in the skylounge. The superyacht had a complete interior refit by Claudette Bonville in 2006 with updated mechanical systems. 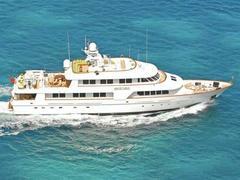 She had her five-year commercial class survey in 2008 and is MCA compliant and ready to cruise, asking $5.9 million.